Who doesn’t love a gift with purchase? 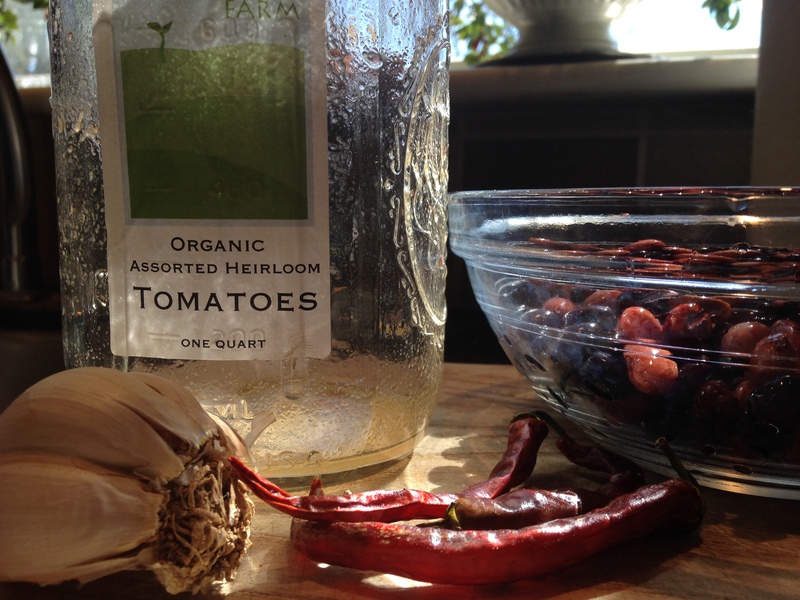 This week our members get a little jar of sunshine with their share – a quart of canned Everblossom tomatoes. There’s nothing like heat in your food to help warm up on the 20 degree days of December. So, let’s try a salsa recipe; it uses those tomatoes, plus the garlic, cayenne peppers, and onion you have been getting. 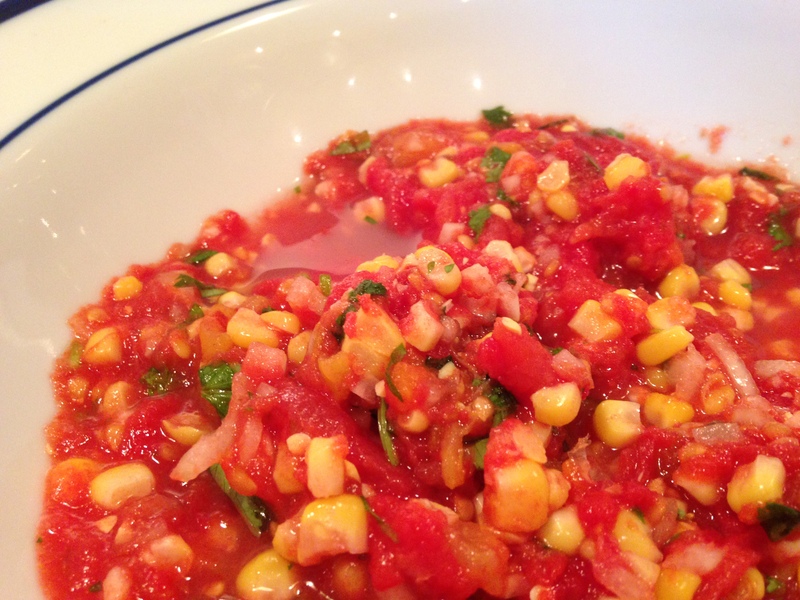 The garden-fresh taste of these tomatoes will wake you up from your winter hibernation, but the magic ingredient in this recipe is the sweet-as-honey corn we froze this summer (or a nice organic choice form the supermarket). 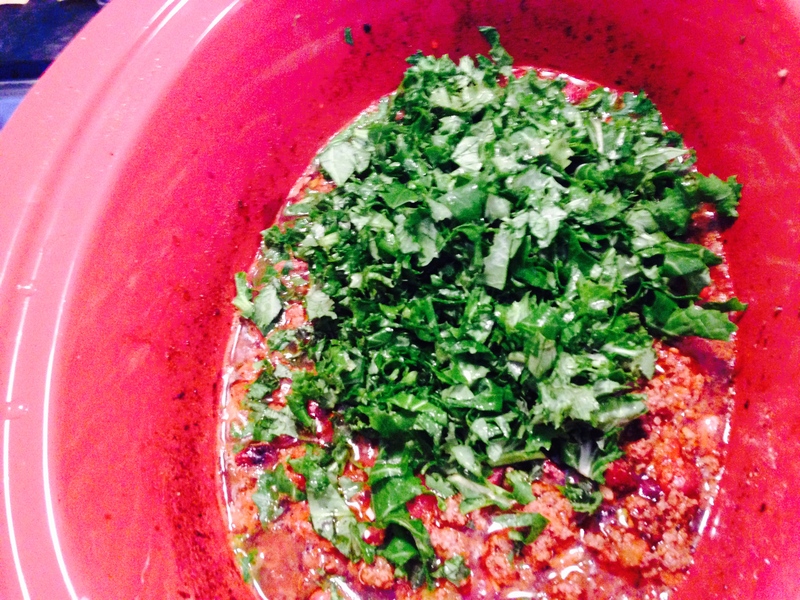 Add all ingredients to a large serving bowl and mix well. Serve with tortilla chips. 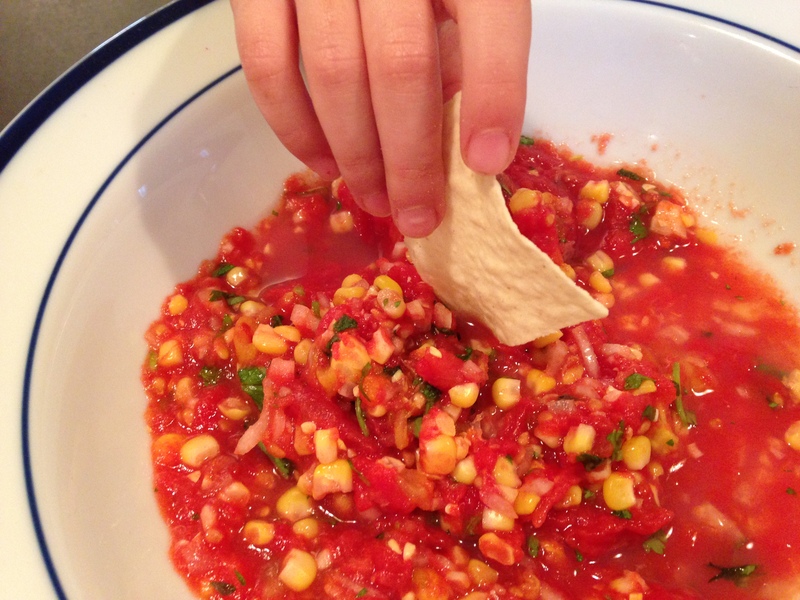 Kitchen Notes: Try making your own tortilla chips! Brush flour tortillas with olive oil; salt lightly; cut into triangles and bake in a 350 degree oven until golden brown, about 5-7 minutes. When I think of New Year’s Eve. I think of dip. French onion dip, blue cheese dip, cream cheese and pepper jelly; it’s all about dip to me. I especially love a baked veggie dip like this one, because it’s dip that I can pretend is a square meal. 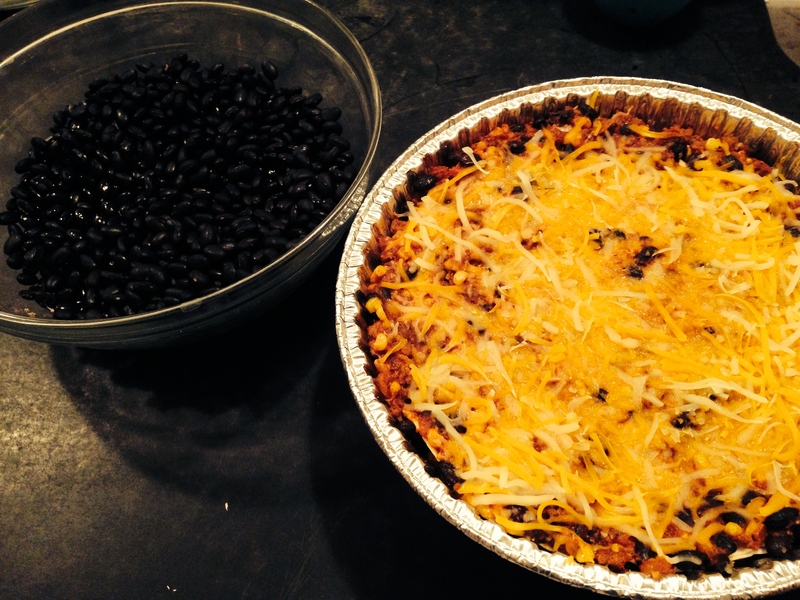 Add a whole grain, baked pita chip or a multi-grain Scoop and it’s just down right health food. 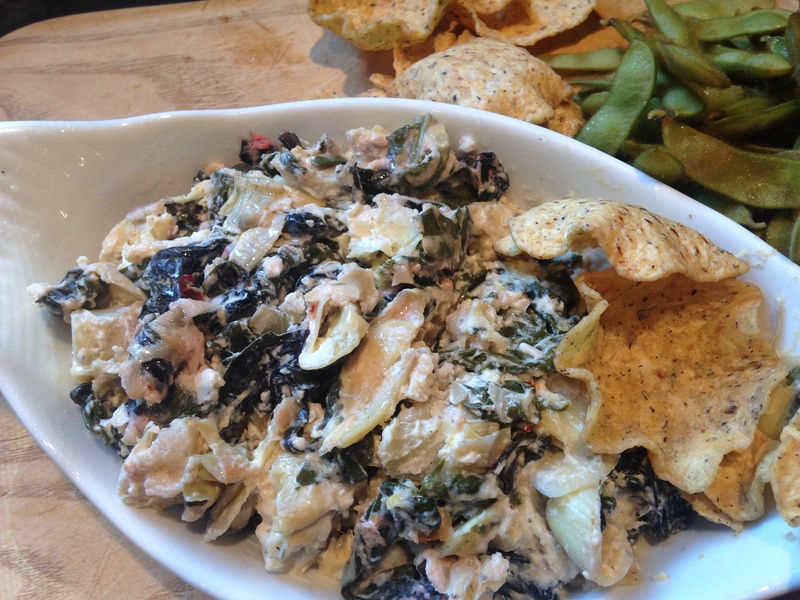 For a cocktail party I had years go, I made a similar spinach dip, but I winged it and threw all the ingredients in the food processor and gave it a whirl. The problem was pureed greens like spinach just turn the whole dish green. It tasted fine, but no one was brave enough to try the swampy green muckity-muck. Please don’t do that – if you must add the spinach only after you process. But, I really suggest you follow the instructions below for creamy dip success. Tostitos Scoops optional but highly recommended . Preheat oven to 375 degrees. Butter or spray a 1 1/2-quart casserole dish with cooking spray and set aside. 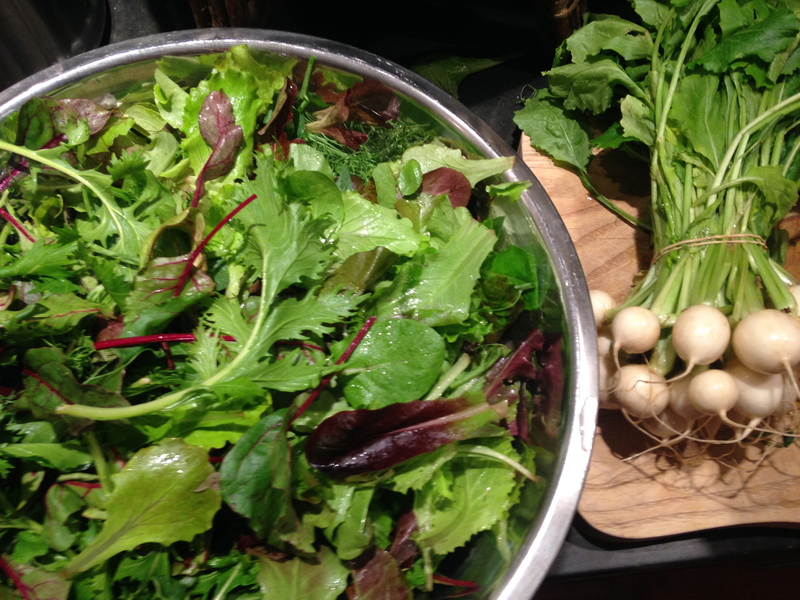 Blanch the greens of your choosing in boiling water until wilted and bright green – a few minutes. Drain and squeeze out as much water as you can. In a medium bowl, mix together all the ingredients with just 1 cup of the Parmesan. 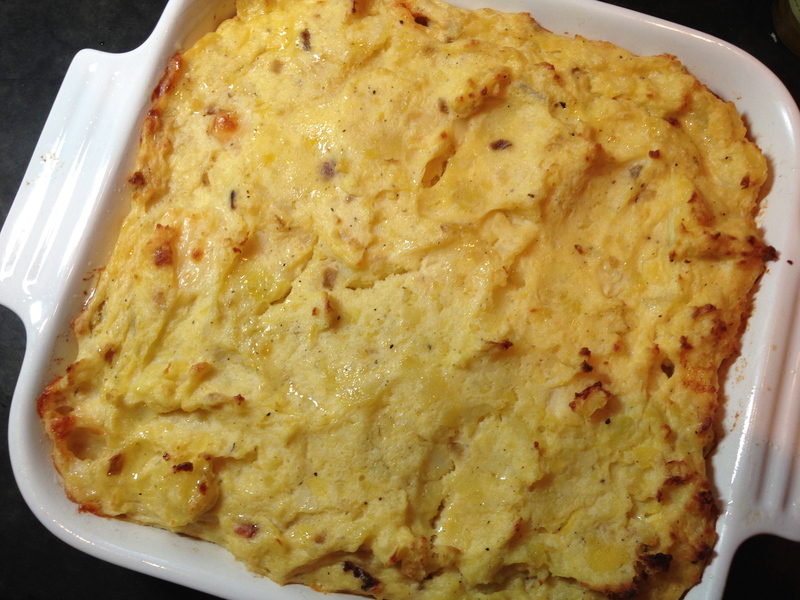 Place into the buttered casserole dish and bake for 30 minutes. The last 5 minutes add the remaining 1/2 cup of parmesan to the top. Serve hot or cold! By cooking these potatoes in their skin and then peeling them, you benefit from more nutrients being absorbed into the potato’s flesh. Plus, they are much easier to peel after they’ve been cooked; just rub them with a paper towel or a butter knife. 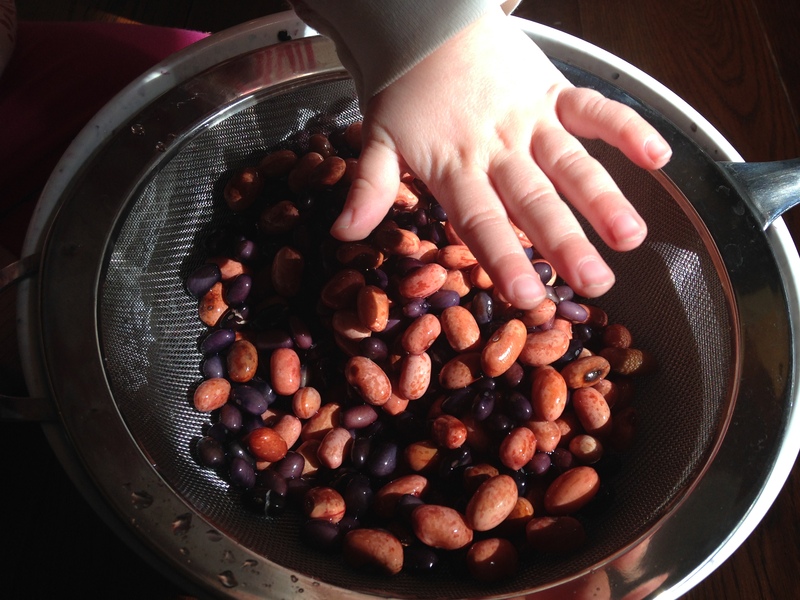 This makes a large batch and is great for serving half and freezing half for later. We reheat a lot of pre-made meals from the freezer. For this reason my man, Eric, says our dish is really thrice baked. Har Har. For fluffier boiled potatoes, after you drain the water, cover the pot with a double thickness of paper towels and the pot’s lid. In ten minutes, steam will be absorbed by the towels and your potatoes will be dry and fluffy. 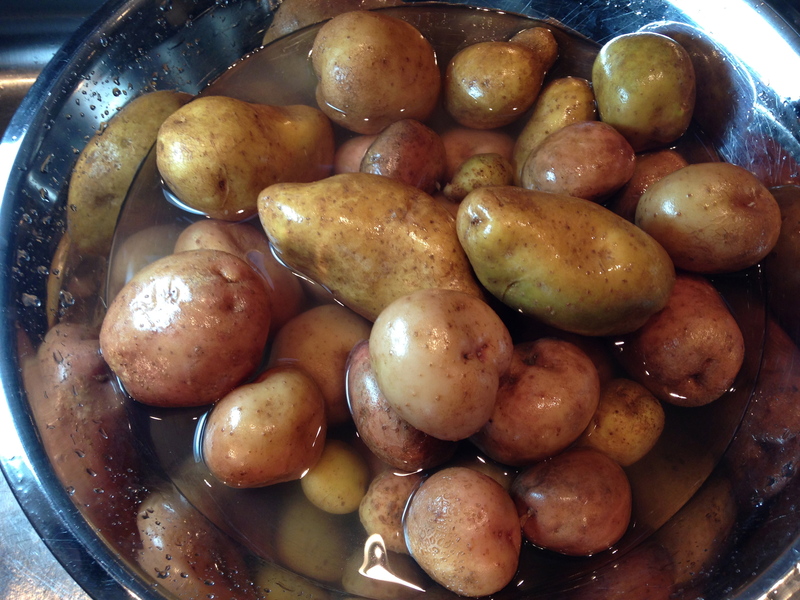 Scrub the potatoes well and rinse under cool running water. Start them in a pot of cool water and bring to a boil together for the most even cooking. Boil in salted water for about 20 minutes or until fork-tender. Drain and set aside until cool enough to handle. When the potatoes have cooled, use a paper towel to rub off their skins. 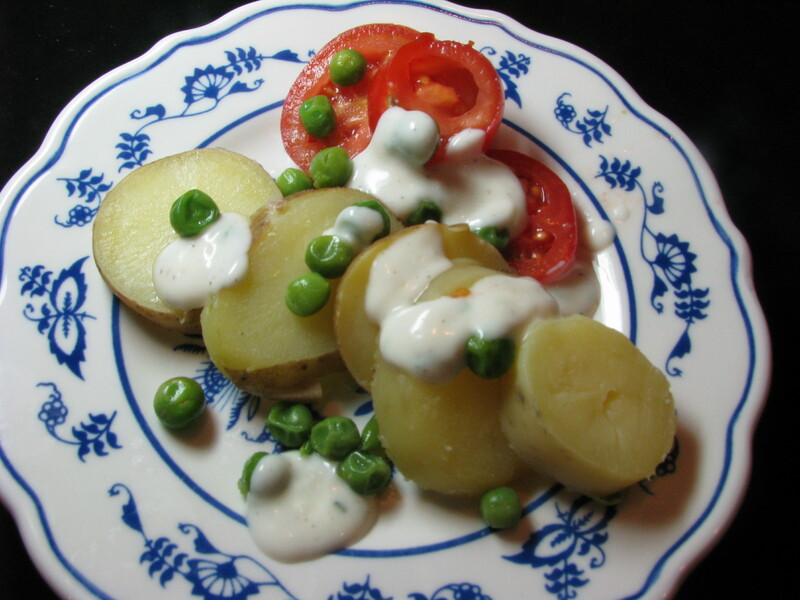 Place the potato flesh in a large bowl and add 1 stick of the butter, the sour cream, heavy cream, salt, and pepper and mash until chunky-smooth. 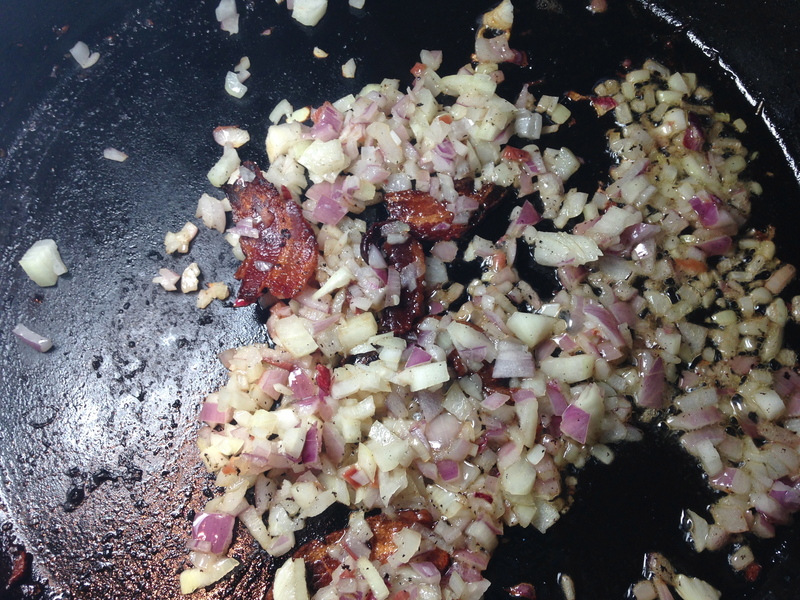 Fry the chopped bacon until the fat is melting and then add the onions. Stir until the onions are softened and absorbing that bacon flavor, about 5 minutes. To the mashed potatoes, add the bacon and onions, cubed white Cheddar and eggs and mix thoroughly. Butter two 8×8-inch casserole dishes (or a single 9 by 13-inch casserole) with the remaining tablespoon of butter. 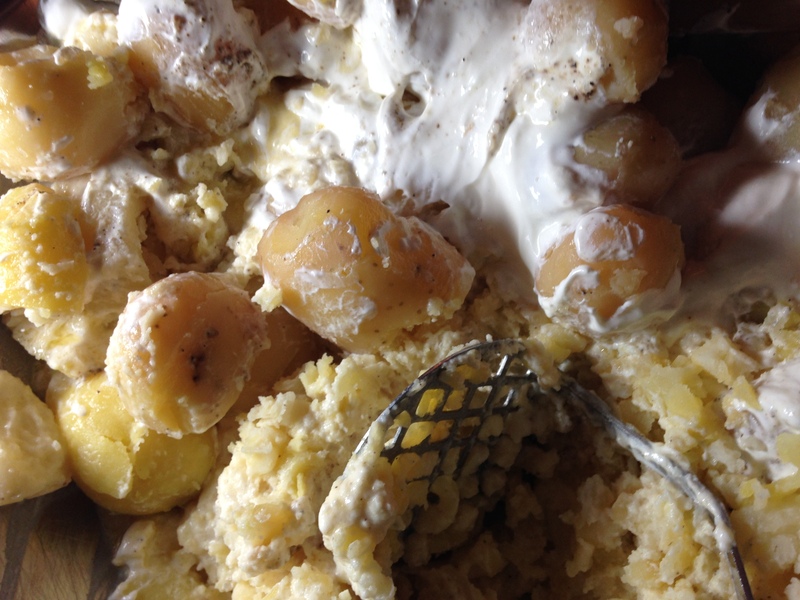 Place the potato mixture in the prepared casserole. Bake for 35 to 40 minutes, or until bubbly around the edges and heated through and the top is lightly browning. Serve hot. This weekend is one big harvest celebration. 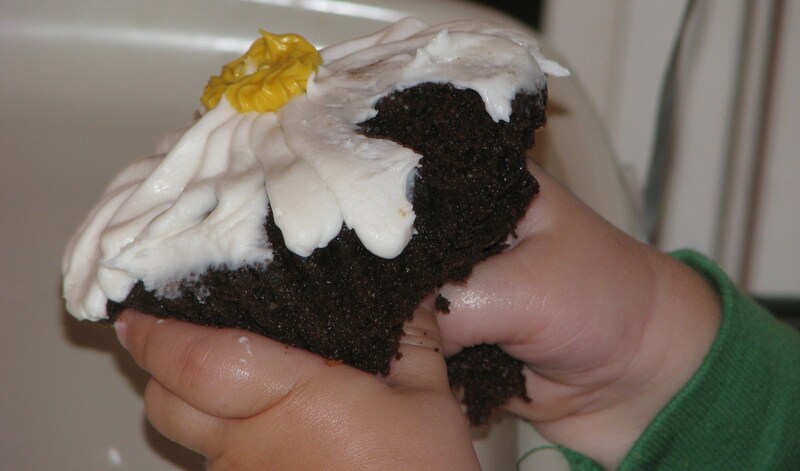 Elaine’s Everblossom Farm CSA Potluck Picnic and Harvest Party is Saturday, October 19, from 12:30 to 4:00. Details are available on our website: www.everblossomfarm.com. It’s rain or shine and friends and members are invited. If you’re curious about the Organic CSA and the farm, please visit us. 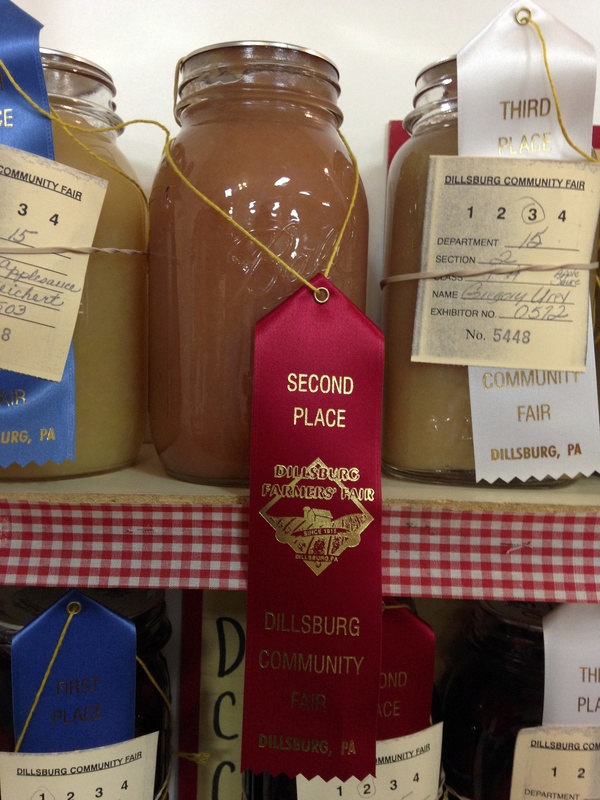 Also this weekend is the Dillsburg Farmer’s Fair. My friends and I have grown up eating the fair food on the street, watching the pumpkin catapulting and the Children’s Parade on Friday night, marching with our high school band in the big parade on Saturday night, walking through the vintage tractors, cars and petting zoo. I am even close personal friends with a previous Farmer’s Fair QUEEN! This year we are taking part in new ways. First, my husband Eric’s South Mountain Cycle Shop will ride their motorcycles in the auto and tractor parade on Saturday at 3:00 pm. Check them out at www.southmountaincycleshop.com.com. 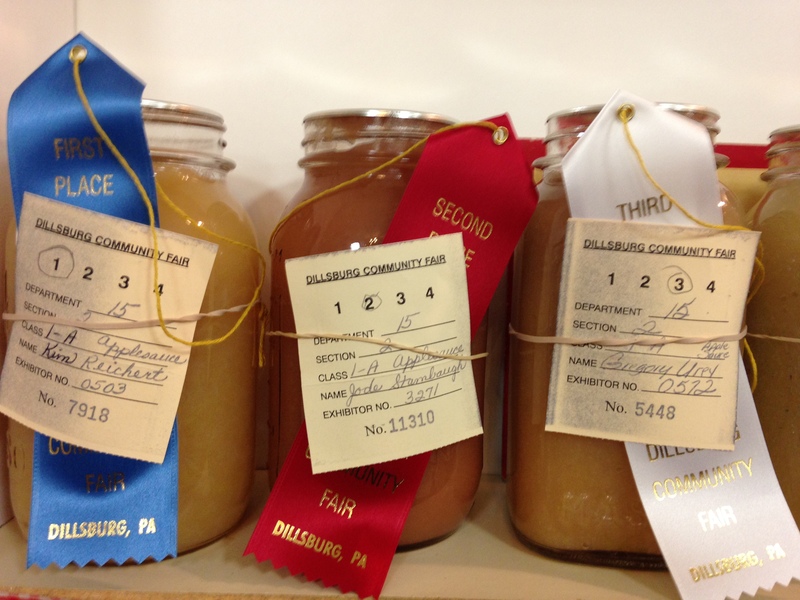 Secondly, this year I have bravely entered the Farmer’s Fair canning competition in two categories; Cut Tomatoes and Applesauce. Right away I must give credit to my dear friend, canning partner and CSA member, Elizabeth. She and I learned to can this year and had an awesome experience doing it. Thanks to her adventurous spirit with a careful and studious approach we learned how to safely and successfully store away tomatoes, apples and peaches. 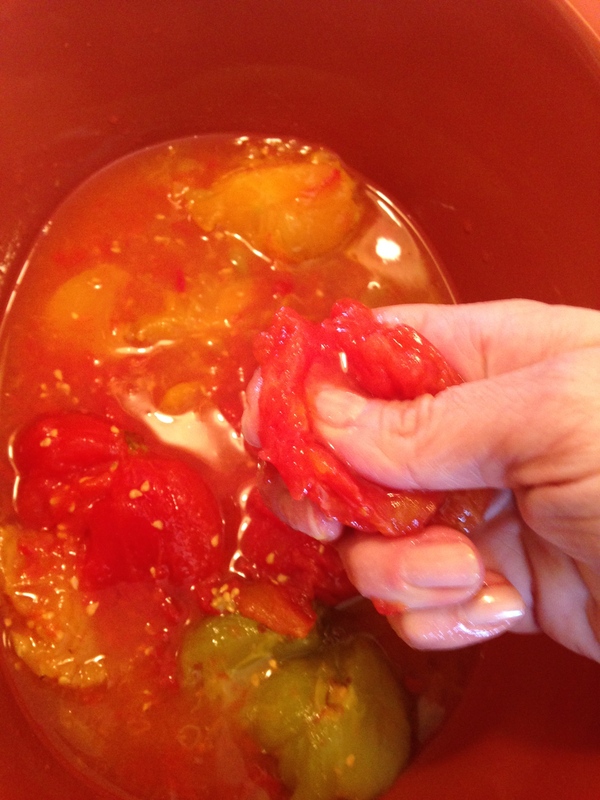 Also, special thanks to my Aunt Jeanne who gave us a hands-on lesson in canning tomatoes that I previously posted about. Now that I have delivered my blue ribbon acceptance speech…please let me tell you I have not often been so intimidated as I was Tuesday night at the community hall dropping off my two fine little quart jar specimens for the judging. I nervously chose the wrong line at first and after switching back and forth to fill out the proper forms, I found myself in front of two ladies taking their jobs as serious as a heart attack. They soberly took my jars and wrote out the tiny tags as I looked around at the other jars full of perfect little globes of beets, cherries, I’m not sure. I had a clear and strong urge to pick up my jars and apologize. Pretend like the whole thing was a big misunderstanding. 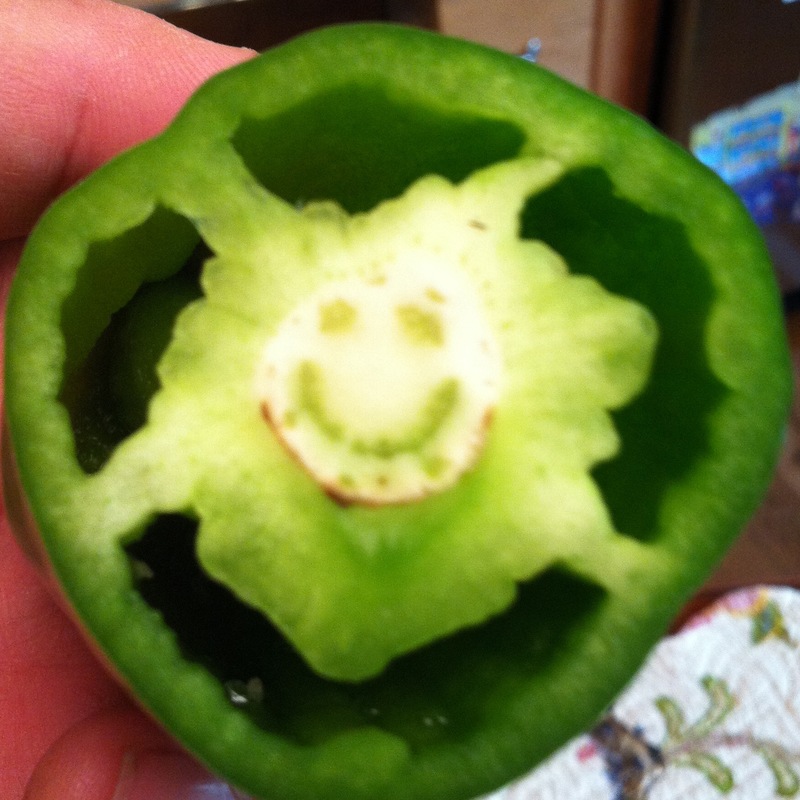 There is no doubt; I am an optimist. It’s not a bad way to go through life, but sometimes makes me feel silly as I was already regarding our pretty jars as “award-winning”. Just as any good mama should, I think they are beautiful — marbled yellow, orange and red heirloom tomatoes, and pretty applesauce that is pink from cooking the Honeycrisp apples in their skin. It made me smile (nervously) at my second thoughts that night and desire to rescue my babies and just take them right back home. Who needs to be judged anyway. But, I was brave. I left them there and I will find out tomorrow how we stack up. If we lose, I will try not to make excuses about local politics. If we win, I will tell the world about it here. Stay tuned! It’s hard to improve on a classic, but we certainly can take the standard Bacon-Lettuce-Tomato sandwich and maximize those few ingredients. B is for Bacon from Nell’s Butcher Shop in East Berlin, PA. Oh, it’s pretty prefect. Just look at it. B.2 is for Bread, really good “artisan” bread from Lark Rise Bakery’s CSA based out of Loysville, PA. Toast your bread and spread on your favorite mayo. L is for Lettuce – in this version it’s Everblossom’s organic peppery arugula and salad mix. Its texture and spice makes the sandwich pop. T is for a sweet, ripe, organic heirloom Tomato from Everblossom Farm. 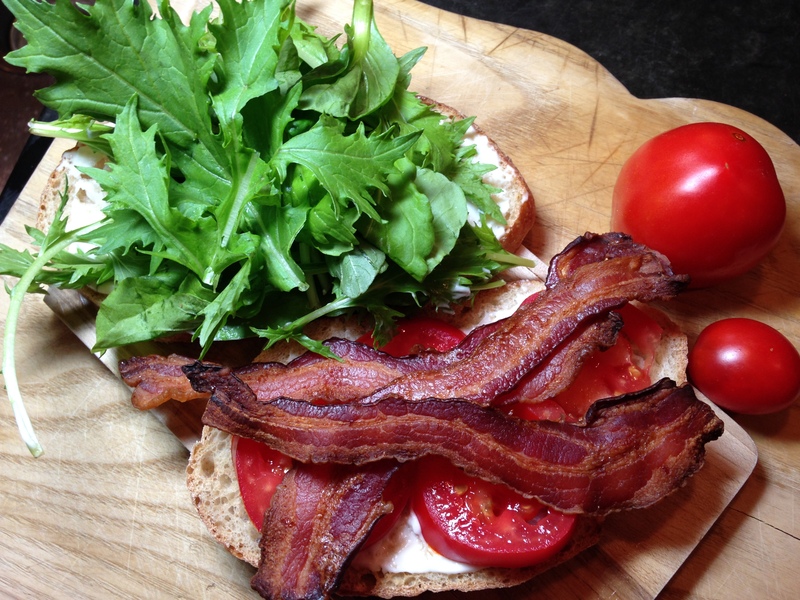 Earlier in summer when basil is also brightening our table, it is also my secret ingredient to brighten my BLT. Use it in place of lettuce or alongside Elaine’s butter crunch variety. Yuh uh um. STILL have buttermilk left over? 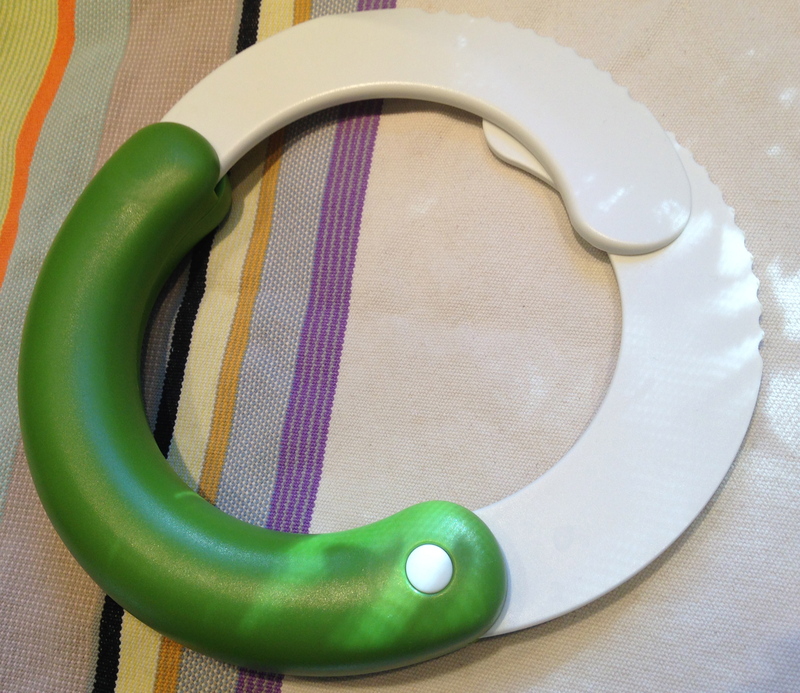 What do you like to make with it? And, why do they sell it in such big containers? We originally bought buttermilk to make some good old fashioned Pennsylvania Dutch sugar cakes and then went searching for inspiration on what to do with the rest. Cinnamon Bread and Eggplant Gratin (see previous post) did not use it all. 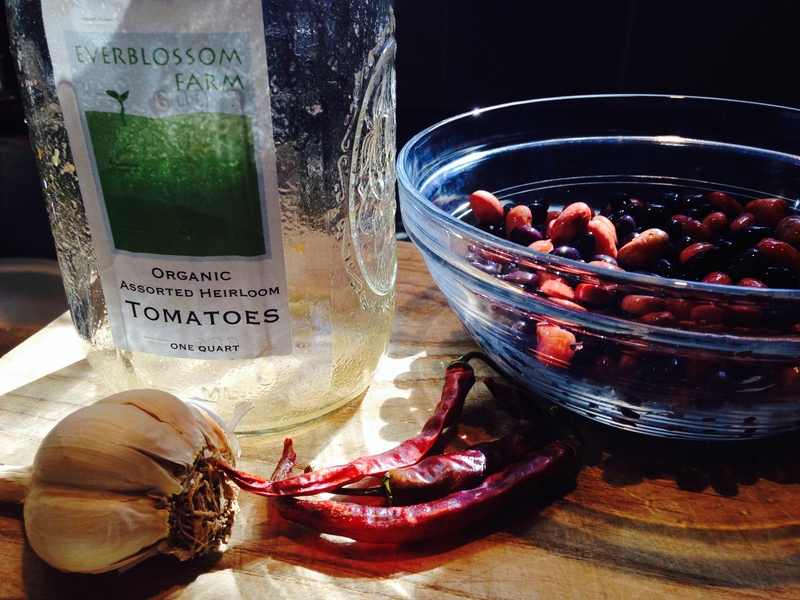 So, we moved on to salad dressing…try it over this week’s peppery salad mix!